Splash 2 data loggers are used to monitor washers and extractors to ensure specified temperatures are reached, and to meet customer quality standards. Johnsons Apparelmaster offers an industrial laundry service to both the food and engineering sectors. The Company's Maintenance Team uses waterproof Tinytag Splash 2 data loggers in proof testing for washers and extractors to ensure critical temperatures are reached. It is essential that these levels are reached and maintained to achieve bacterial cleanliness to satisfy food industry standards. Three Splash 2 data loggers are used with the probes placed in the water outlets of the washing machines and inside the garments when being tunnel finished. Recorded information is analysed to make any necessary adjustments to the temperatures of the machines and to provide proof to customers that all conditions are being met. David Isherwood is part of Johnsons Apparelmaster's Maintenance Team and comments, "We chose Tinytags because they stand up to the harsh conditions and provide us with all the information we require. 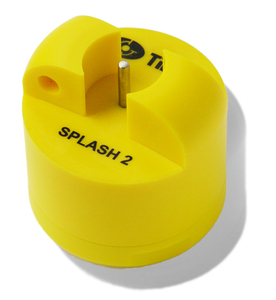 We find the results obtained from the Splash 2 data loggers to be accurate, comprehensive and consistent." Gemini Data Loggers Cathy Clark confirms "This is a typical application for the Splash 2: a requirement for a waterproof data logger designed for a high temperature environment where a fast response is needed."